첫 만남, 헤어짐, 통성명 등 특정 상황에서 사용되는 회화 표현을 중심으로, 관련된 문법, 어휘, 유용한 표현, 심지어 미국 문화까지 함께 배울 수 있게 개발된 회화 과정입니다. 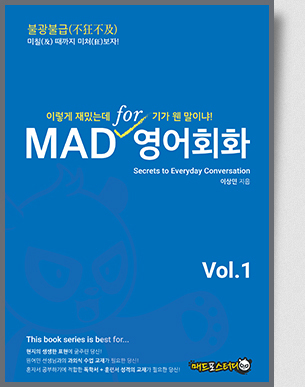 본 과정은 ㈜매드포스터디에서 원어민과의 회화수업에 특화하여 개발한 『MAD for 영어회화』 시리즈를 교재로 채택하고 있습니다. 예/복습, 필기 등 학습의 용이함을 위해서는 교재를 구입해서 학습하는 것이 좋습니다. 다음 내용은 웹북에 포함되어 있지 않으며, 교재를 통해서만 이용할 수 있습니다. 084 What do you do in the morning? 넌 아침에 보통 뭐 해? 085 Did you sleep well last night? 간밤엔 잘 잤어? 086 What do you usually do after work? 넌 일 끝나면 보통 뭐 해? 087 How do you feel today? 너 오늘 기분/컨디션 어때? 088 I’m shocked. 나 충격받았어. 089 I’m bored to death. 나 지루해서 죽을 맛이야. 090 You’re so dead. 넌 이제 죽었다. 091 He’s still angry at me. 걔 아직 나한테 화 안 풀렸어. 092 How do you feel about him? 걘 느낌이 어때? 093 You look marvelous today. 너 오늘 정말 멋져 보여. 094 You look nervous. Are you okay? 너 긴장한 거 같은데. 괜찮아? 095 You look so tired today. 너 오늘 엄청 피곤해 보여. 096 You look like hell! 너 몰골이 완전 장난 아니야! 097 Do I look like a pushover to you? 네가 보기엔 내가 그리 만만해 보여? 098 What’re you like? 넌 어떤 성격을 가졌어? 099 I’m an indecisive person. 난 우유부단한 사람이야. 100 What kind of person is she? 걘 어떤 사람이야? 101 What a good idea! 정말 좋은 생각이네! 102 What color is it? 그건 무슨 색이야? 103 I love this yellowish sweater. 난 누르스름한 이 스웨터가 무척 마음에 들어. 104 What does he look like? 걘 어떻게 생겼어? 105 She has strawberry blond hair. 걔 머리는 붉은빛이 도는 금발 머리야. 106 Can you describe her face? 걔 얼굴은 어떻게 생겼어? 107 What happened to your eyes? 너 눈 왜 그래? 108 Put your hands up! 손들어! 109 Who’s up for a movie? 영화 볼 사람? 110 Let’s just play it by ear. 그냥 상황 봐서 되는 대로 하자. 111 I hurt my ankle. 나 발목 다쳤어. 112 I sprained my wrist. 나 손목 삐었어. 113 I have a slight fever. 나 열이 좀 있어. 114 I’m suffering from food poisoning. 나 식중독 때문에 고생 중이야. 115 I have a splitting headache. 나 머리가 쪼개질 듯이 아파. 116 How’s your cold? 감기는 좀 어때? 117 I’m on my way to the E.R. 나 지금 응급실 가는 길이야. 118 I need to check into the hospital. 나 병원에 입원해야 해. 119 How many are there in your family? 네 가족은 모두 몇 명이야? 120 She’s my soon-to-be bride. 저 여자는 내 예비신부야. 121 What do you do for a living? 넌 무슨 일 해? 122 He works for Samsung. 걔 삼성 다녀. 123 I want to be a high school teacher. 난 고등학교 교사가 되고 싶어. 124 I wanted to be a brilliant scientist. 난 뛰어난 과학자가 되고 싶었어. 125 I hope to be an artist. 난 예술가가 되고 싶어. 126 I wish I were rich. 내가 부유하면 좋을 텐데. 곧 출간 예정입니다. 조금만 기다려 주세요.